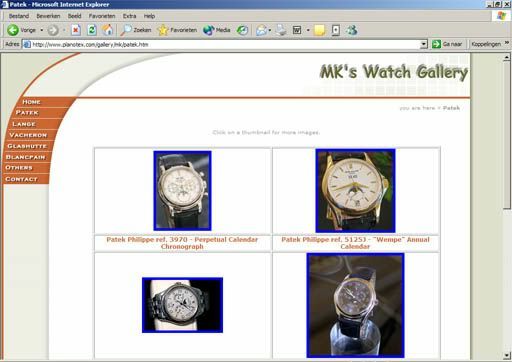 Jean-Marie gave me the link to this site, MK’s Watch Gallery! This guy has a stunning collection of Patek Philippe watches, A. Lange & Soehne, Vacheron et Constantin, Blancpain, Roger Dubuis and so on. It is also great that a watchcollector with a high-end collection can appreciate an Omega Seamaster Pro, it is on the ‘Others’ page on his website. “I want to inform all the Time Zone community that our dear friend Mark R. Kolitz passed away today December 18, 2004 in Plano Texas. He was a superb collector of watches, and in particular Patek Philippe watches. His knowledge of the history of the company was unequaled. Mark posted many outstanding pictures of his beloved collection. His web-site is a great example of the time he took in photographing his collection. Mark was a regular contributor to the PP Time Zone form and several others. I for one talked by telephone to him almost every day, till his brain cancer became so overwhelming that his motor functions would not allow him to carry on a conversation. The last time I saw Mark was at dinner here in Miami in early October. He had a great desire to fight the disease and told me so. Mark leaves behind his wonderful wife and two beautiful daughters. Good by for now my dear friend.